There are many kinds of button Switch, which can be divided into ordinary button type, mushroom head type, and so on. Self locking, self reset, screw handle, indicator lamp, light sign, and key, etc. has a single button, double buttons, three knobs, and different combinations. Generally, it consists of a block structure, consisting of a button cap, a reset spring, a bridge type contact, and a shell, usually made of a complex, with a pair of normally closed contacts and constant contact. Some products can increase the number of contacts by connecting series of components. There is also a self-sustaining button. After pressing, it can automatically hold the closed position and turn it off after power failure. 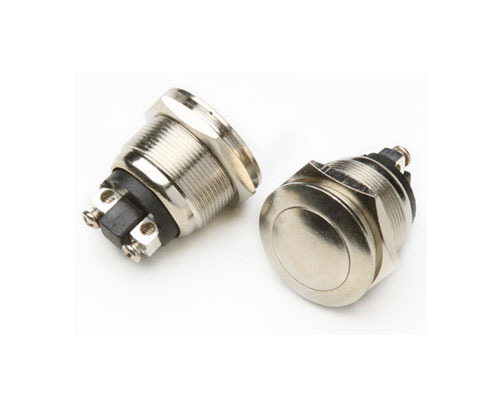 Looking for ideal Emergency Stop Button Switch Manufacturer & supplier ? We have a wide selection at great prices to help you get creative. All the Stainless Steel Push Button Switch are quality guaranteed. We are China Origin Factory of Momentary Led Pushbutton Switch. If you have any question, please feel free to contact us.